For the Spanish actress and singer, see Bibí Andersen. For the American actress Mary "Bebe" Anderson, see Mary Anderson. 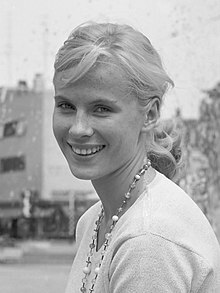 Berit Elisabeth Andersson (11 November 1935 – 14 April 2019), known professionally as Bibi Andersson (Swedish: [²bɪbːɪ ²anːdɛˌʂɔn]), was a Swedish actress who was best known for her frequent collaborations with filmmaker Ingmar Bergman. Andersson was born in Kungsholmen, Stockholm, the daughter of Karin (née Mansion), a social worker, and Josef Andersson, a businessman. Her first collaboration with Ingmar Bergman came in 1951, when she participated in his production of an advertisement for the detergent Bris. She also worked as an extra on film sets as a teenager, and studied acting at the Terserus Drama School and at the Royal Dramatic Theatre School (1954–1956). She then joined the Royal Dramatic Theatre in Stockholm. In the 1950s, 1960s, and 1970s, Andersson starred in ten motion pictures and three television films directed by Bergman. With Ingrid Thulin and Eva Dahlbeck, she shared the Best Actress Prize at the 1958 Cannes Film Festival for the director's Brink of Life, a film set in a maternity ward. The others included The Seventh Seal, Wild Strawberries, The Magician, The Passion of Anna, The Touch, and Persona. In 1963, Andersson won the Silver Bear for Best Actress at the 13th Berlin International Film Festival for her performance in Vilgot Sjöman's The Mistress. Andersson's intense portrayal of a nurse in the film Persona (1966), in which the actress Elizabet Vogler (Liv Ullmann) is mostly mute suffering from a psychosomatic condition, meant that she delivered the majority of the dialogue. For her performance in Persona, she won the award for Best Actress at the 4th Guldbagge Awards. That year alongside James Garner and Sidney Poitier in the western Duel at Diablo. More Bergman collaborations followed, and she worked with John Huston (The Kremlin Letter, 1970) and Robert Altman (Quintet, 1979, with Paul Newman). She was actor Steve McQueen's co-star in his only credited film as a producer, the film of Arthur Miller's stage adaptation of Henrik Ibsen's An Enemy of the People (1977). Andersson made her debut in American theatre in 1973 with a production of Erich Maria Remarque's Full Circle. Her most famous American film is I Never Promised You a Rose Garden (1977), which also starred Kathleen Quinlan. In 1990, Andersson worked as a theatre director in Stockholm, directing several plays at Dramaten. In the late 1980s and early 1990s, she worked primarily in television and as a theatre actress, working with Bergman again, and others. She was also a supervisor for the humanitarian project the Road to Sarajevo. In 1996, Andersson published her autobiography, Ett ögonblick (A Moment, or, literally, A Blink of the Eye). She was married first to the director Kjell Grede (1960, divorced) with whom she had a daughter; and secondly to politician and writer Per Ahlmark (1978, divorced). Andersson then married Gabriel Mora Baeza on 29 May 2004. In 2009, she had a stroke. An article published in 2010 says that from that time on she had been hospitalized and was unable to speak. Andersson died on 14 April 2019 at age 83. 73767 Bibiandersson, a minor planet discovered by Eric Walter Elst, is named after her. ^ Thomson, David (2014). The New Biographical Dictionary of Film: Sixth Edition. Knopf Doubleday Publishing Group. p. 68. ISBN 9781101874707. ^ a b c d Gates, Anita (14 April 2019). "Bibi Andersson, Luminous Presence in Bergman Films, Dies at 83". The New York Times. Retrieved 14 April 2019 – via NYTimes.com. ^ a b Segrave, Kerry; Martin, Linda (1990). The Continental Actress: European Film Stars of the Postwar Era. McFarland. p. 274. ISBN 0-89950-510-4. ^ a b Wilson, H.W. Current biography yearbook. H.W. Wilson Company. p. 13. ISBN 0-8242-0997-4. ^ "Bibi Andersson Film Reference biography". Filmreference.com. 11 November 1935. Retrieved 3 August 2010. ^ a b "Eight key actors in the Ingmar Bergman universe". British Film Institute. Retrieved 14 April 2019. ^ Macnab, Geoffrey (6 January 2003). "Now wash your hands". The Guardian. Retrieved 14 April 2019. ^ "Bibi Andersson, 'Persona,' 'The Seventh Seal' Actress, Dies at 83". Variety. Retrieved 15 April 2019. ^ a b Bergan, Ronald (15 April 2019). "Bibi Andersson obituary". The Guardian. Retrieved 15 April 2019. ^ "Berlinale: Prizes & Honours 1963". Berlinale.de. Internationale Filmfestspiele Berlin. Retrieved 13 February 2010. ^ "Persona". Swedish Film Institute. 1 March 2014. ^ "The Kremlin Letter (1970)". Shock Cinema Magazine. Retrieved 14 April 2019. ^ "Film: Altman Offers Apocalyptic Fantasy:End Game". The New York Times. Retrieved 14 April 2019. ^ "MCQUEEN IN 1976 'ENEMY OF THE PEOPLE'". The New York Times. Retrieved 15 April 2019. ^ Barnes, Clive (8 November 1973). "The Stage: Remarque's 'Full Circle'". The New York Times. Retrieved 14 April 2019. ^ Ebert, Roger. "I Never Promised You a Rose Garden". RogerEbert.com. Retrieved 14 April 2019. ^ "Arkivet Rollboken – Dramaten". www.dramaten.se. Retrieved 14 April 2019. ^ "Bibi Andersson". Ingmar Bergman. Retrieved 14 April 2019. ^ "Ett ögonblick från 1996". tradera. Retrieved 14 April 2019. ^ "Bibi Andersson Biography". Film Reference. Retrieved 14 April 2019. ^ "Bibi Andersson gift i hemlighet". aftonbladet. Retrieved 14 April 2019. ^ "Acclaimed actress Bibi Andersson has died, aged 83". Far Out Magazine. Retrieved 14 April 2019. ^ "Nu kämpar Bibi för att prata igen". Expressen. Retrieved 25 December 2014. ^ "Bibi Andersson dies at 83". The Washington Times. Retrieved 14 April 2019. ^ "Bibi Andersson". Svensk Filmdatabas. Retrieved 14 April 2019. ^ "Sweden's Bibi Andersson holds out her Ibsen Centennial Award". Getty Images. Retrieved 14 April 2019. ^ Schmadel, Lutz D. (2015). Dictionary of Minor Planet Names: Addendum to 6th Edition: 2012-2014. Springer. p. 192. ISBN 9783319176772. Wikimedia Commons has media related to Bibi Andersson.